News that evolutionary biology has closed another gap and found no gods in it, left creationists totally uninterested again today. There’s a reason they were yawning. See below. The gap was one that Darwin pondered over - the origin of two of the recently-extinct (geologically speaking) South American ungulates. They seemed to be a mixture of hippopotamus, rhinoceros, rodent, camel, and even elephant in that they appeared to have a small trunk. 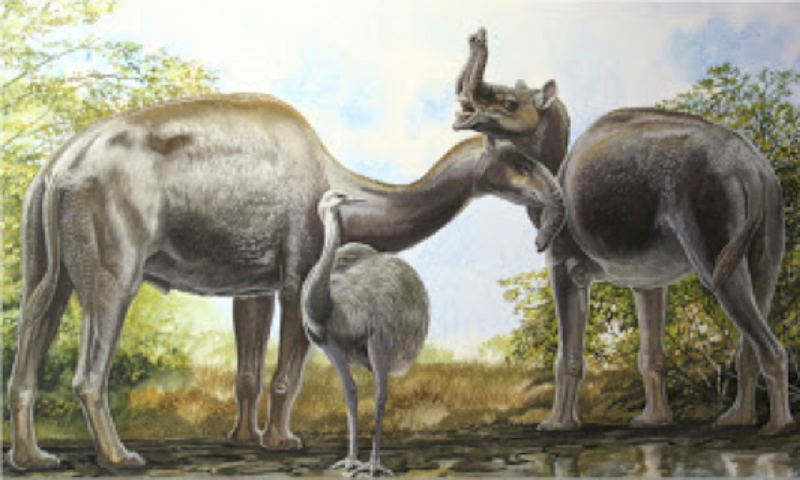 Some biologists had suggested they may be related to African species such as elephants or aardvarks while others thought they may be related to South American species like armadillos and sloths. We have resolved one of the last unresolved major problems in mammalian evolution: the origins of the South American native ungulates. Now scientists have succeeded in using a new analytical technique on collagen recovered from the bones of Toxodon and Macrauchenia and shown them to be related to the mammalian group which includes horses, tapirs and rhinoceroses. Collagen is a fibrous, structural protein which is even more stable than DNA. It is found widely in a mammalian body including skin, hair, horn, hooves as well as bone. This new technique allows samples of collagen to be compared to that of other animals and, just as with comparing the DNA in the same gene from different animals, arranging the degree of difference in a family tree, showing their evolutionary relationship. As with every other 'mystery' in science, the answer turned out to be something perfectly natural with no magic and no gods involved. The gap between ungulates may have troubled Darwin, but it hardly qualifies as a mystery. If you want mystery, try the origin of the universe, or the origin of “nature” itself, which you call upon as your explanatory agent. There’s a mystery. The gap which creationist have to close now is how come two species which went extinct some 4,000 years before the Earth and life on it were created by magic just 6,000 years ago, were related to animals that hadn't been created yet? If any creationist can close this gap with evidence, please feel free to show it here. You appear to be aiming your critique at young earth creationists. They don’t agree with your dating or estimates of molecular clocks. So your 10,000 year age for the extinction is something they would dispute. I'm just pointing out the flaws in your argument. If you are going to argue with someone you should always present his/her position fairly. BTW, I am not a young earth creationist, so I don’t dispute your dates and your argument still fails completely. Why shouldn’t we find sequence similarity among animals with similar morphologies and/or histories? Since we are on the topic, all the paper presents is sequence similarity. The authors assume evolution as a fact, just as they assume common descent as a fact. They use those assumptions as a means of interpreting their data, as an explanatory filter. But the paper doesn’t do anything other than claim a new evolutionary ancestral relationship between modern ungulates and these extinct ones. It certainly doesn't prove evolution is true.